The House of Braganza (Portuguese: Casa de Bragança, Portuguese pronunciation: [bɾɐˈɣɐ̃sɐ]), formally the Most Serene House of Braganza (Sereníssima Casa de Bragança), or, in Brazil, the Most August House of Braganza (Augustíssima Casa de Bragança), is an imperial, royal, and noble dynasty of Portuguese origin, a branch of the House of Aviz, and thus a descendant house of the Portuguese House of Burgundy. The House evolved from being powerful dukes of Portuguese nobility, to ruling as the monarchs of Portugal and the Algarves, from 1640 to 1910, and as monarchs of Brazil, from 1815 to 1889. 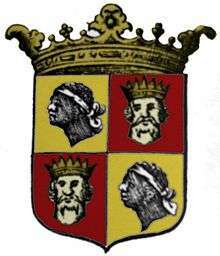 The House of Braganza was founded in 1442, when Afonso, 8th Count of Barcelos, illegitimate son of King John I of Portugal of the House of Aviz, was made Duke of Braganza as Afonso, Duke of Braganza, by his nephew, King Afonso V of Portugal. The feudal Brigantine dukes quickly amassed a fortune in properties, titles, and power and by the time of Fernando II, Duke of Braganza, the House was the most powerful in all of Portugal and of the greatest houses of the Iberian Peninsula. The House of Braganza became the rulers of the Kingdom of Portugal and the Algarves in 1640 when John IV of Portugal was declared king by the Portuguese nobility and subsequently waged the Portuguese Restoration War. The House of Braganza was only recognized as the legitimate ruling house of Portugal by the Philippine Dynasty during the reign of Afonso VI of Portugal, though effective and official control of the kingdom was seized and established in the 1640s. The Braganzas were deposed from the Portuguese throne in 1910, when the Portuguese Republic was proclaimed. The House of Braganza became the reigning house of Brazil, first, when the United Kingdom of Portugal, Brazil and the Algarves was created in 1815. The United Kingdom lasted until 1822, when the Empire of Brazil became independent from Portugal. The new Brazilian nation was led by Prince Pedro of Braganza, heir to the Portuguese throne, who ruled as Emperor Pedro I of Brazil, as well as King Pedro IV of Portugal. Until 1835, the Portuguese Braganzas were still in the line of succession to the Brazilian throne. The House was deposed from the Brazilian throne in 1889 when Brazil was proclaimed a republic. In 1834, with the end of the Liberal Wars, won by Emperor Pedro I of Brazil and Queen Maria II of Portugal against King Miguel I of Portugal, the House of Braganza was split into three branches. The first branch was the Legitimist House of Braganza, headed by Queen Maria II of Portugal, daughter of King Pedro IV, and her descendants, who ruled the Kingdom of Portugal. The second branch was the Brazilian House of Braganza, headed by Emperor Pedro I of Brazil, and his descendants, who ruled the Empire of Brazil. The third branch was the Miguelist House of Braganza, headed by King Miguel I of Portugal, and his descendants, who claimed the Portuguese throne after King Manuel II of Portugal's death, in 1932. In 1835, Queen Maria II of Portugal married Prince Ferdinand of Saxe-Coburg-Gotha, later King Ferdinand II of Portugal. Despite the tradition of following the custom of patrilineal descent of royal houses, common throughout Europe, the children of the marriage between Queen Maria II and King Fernando II were members of the House of Braganza and ruled Portugal as Brigantine monarchs, not as Saxe-Coburg-Gotha monarchs. Some foreign genealogists have classified the descendants of Maria II and Fernando II into a separate house, usually named the House of Braganza-Saxe-Coburg and Gotha however, Article 5 of the Portuguese constitution of 1826 clearly states that "Continues the Reigning Dynasty of the Most Serene House of Braganza in the Person of Lady Princess Maria da Glória, by the Abdication and Cession of Her August Father Lord Pedro I, Emperor of Brazil, Legitimate Heir and Successor of Lord João VI.". After the proclamation of the republic in Brazil, the House continued to be the claimant house to the Brazilian throne until 1921, when Isabel, Princess Imperial of Brazil, daughter of Emperor Pedro II of Brazil, died and her claim passed to her grandson, Prince Pedro Henrique of Orléans-Braganza, and thus the House of Orléans-Braganza became the claimant house to the former monarchy of Brazil. The renunciation of dynastic rights, by Princess Isabel's eldest son, Pedro de Alcântara, Prince of Grão-Pará, later led to a dispute between the members of the Imperial House, and thus the leadership of the House of Orléans-Braganza is disputed by two branches of the House: the Vassouras branch, headed by Prince Luiz of Orléans-Braganza, and the Petrópolis branch, headed by Prince Pedro Carlos of Orléans-Braganza. When the Portuguese Republic was established, in 1910, King Manuel II and the rest of the Legitimist Braganzas went into exile. In 1932, when Manuel II died, the Legitimist House became extinct and the claim to the Portuguese throne passed to the descendants of King Miguel I, the Miguelist Braganzas, by way of Duarte Nuno, Duke of Braganza. The claim to the crown of Portugal, and thus to the leadership of the House of Braganza, passed to Prince Duarte Nuno's son, Duarte Pio, Duke of Braganza, when he died in 1976. The House of Braganza originated with Afonso I, an illegitimate son of King John I of Portugal, founder of the House of Aviz, and Inês Pires. [lower-alpha 1] Though Afonso was illegitimate, his father valued and cared for him a great deal, demonstrated by his arrangement of Afonso's marriage to Beatriz Pereira de Alvim, daughter of Nuno Álvares Pereira, Portugal's most important general and a personal friend of King John I. As well as increasing his social status by his marriage into a well-established house, Afonso also became the eighth Count of Barcelos, an honour ceded to him by his father-in-law, who had been made the seventh count by John I.
Jaime I, the Duke who restored the House's prestige after the João II affair. The children of Jaime I, both the two first children by his first wife, Leonor of Pérez de Guzman, and the later eight children by his second wife, Joana of Mendoça, all saw successful lives under the restored House of Braganza. Jaime I's first daughter, Isabel of Braganza, married Infante Duarte, Duke of Guimarães, and had three children, while his first son and successor, Teodósio I, was a successful prince of the renaissance. Five of Jaime I's children, Jaime, Maria, Fulgêncio, Teotónio, and Vicência, all entered into religious orders. The Duke's second daughter, Joana of Braganza, married Bernardino de Cardenas, 3rd Marquis of Elche, and his third daughter, Eugénia of Braganza, married Francisco de Melo, 2nd Marquis of Ferreira. Jaime I's only other son, other than Teodósio I, to not enter into the church, Constantino of Braganza, married Maria de Melo, daughter of D. Rodrigo de Melo, 1st Marquis of Ferreira, but had no children. Constantino was famed as a great officer of the Portuguese Empire, having served as the Viceroy of Portuguese India and Captain of Ribeira Grande, among other positions. Teodósio I, the Duke who personified the prince of the Portuguese Renaissance. João II raised the noble house to the ruling dynasty as King João IV of Portugal. Afonso VI of Portugal, the king during whose reign the Restoration War ended. Braganza coat of arms on the reverse of a 1729 eight gold escudo coin (depicting João V on the front). King João VI of Portugal's children split the Brigantine House into three branches. Manuel II, the last King of Portugal and the last Braganza monarch. Maria II married Prince Ferdinand of Saxe-Coburg and Gotha. Maria II was succeeded in 1853 by her son D. Pedro V, a hard-working reformer who died prematurely in 1861 due to cholera. D. Pedro V was succeeded by his brother D. Luís, as D. Pedro V had no children. D. Luís I was succeeded in 1889 by his son D. Carlos. Carlos was assassinated in 1908 together with his eldest son, D. Luís Filipe, Prince Royal of Portugal and Duke of Braganza, by republicans. His younger son, D. Manuel, Duke of Beja, survived the attack on his father and elder brother and became King as Manuel II, but was toppled two years later in the 1910 republican revolution. After the revolution, Manuel was forced into exile in England by the Portuguese First Republic, but he would continue to support his fatherland until his death. Pedro I, the first monarch of the independent Brazil. Pedro II, the last Emperor of Brazil. On September 7, 1822, Dom Pedro of Braganza, Prince Royal of Portugal, Brazil and the Algarves, member of the House of Braganza, heir apparent to the Portuguese throne and Regent of the Kingdom of Brazil, declared the country's independence from the United Kingdom of Portugal, Brazil and the Algarves and was acclaimed Emperor of Brazil. On 12 October, the prince was acclaimed Pedro I, first Emperor of the newly created Empire of Brazil, a constitutional monarchy. In 1825, signing the treaty of Rio de Janeiro of this date, his father, King Dom João VI, recognized the independence of the new state, the former Portuguese dominion, now Empire of Brazil. Other difficulties arose when the Empire's parliament opened in 1826. Pedro I, along with a significant percentage of the legislature, argued for an independent judiciary, a popularly elected legislature and a government which would be led by the emperor who held broad executive powers and prerogatives. Others in parliament argued for a similar structure, only with a less influential role for the monarch and the legislative branch being dominant in policy and governance. The struggle over whether the government would be dominated by the emperor or by the parliament was carried over into debates from 1826 to 1831 on the establishment of the governmental and political structure. Unable to deal with the problems in both Brazil and Portugal simultaneously, the Emperor abdicated on behalf of his son, Pedro II, on 7 April 1831 and immediately sailed for Europe to restore his daughter to her throne. Pedro I's successor in Brazil was his five-year-old son, Pedro II. As the latter was still a minor, a weak regency was created. The power vacuum resulting from the absence of a ruling monarch as the ultimate arbiter in political disputes led to regional civil wars between local factions. Having inherited an empire on the verge of disintegration, Pedro II, once he was declared of age in 1840, with 14 years old, managed to bring peace and stability to the country, which eventually became an emerging international power. Brazil was victorious in three international conflicts (the Platine War, the Uruguayan War and the Paraguayan War) under Pedro II's rule, and the Empire prevailed in several other international disputes and outbreaks of domestic strife. With prosperity and economic development came an influx of European immigration, including Protestants and Jews, although Brazil remained mostly Catholic. Slavery, which had initially been widespread, was restricted by successive legislation until its final abolition in 1888 by Princess Isabel. Even though the last four decades of Pedro II's reign were marked by continuous internal peace and economic prosperity, he had no desire to see the monarchy survive beyond his lifetime and made no effort to maintain support for the institution. The next in line to the throne was his daughter Isabel, but neither Pedro II nor the ruling classes considered a female monarch acceptable. Lacking any viable heir, the Empire's political leaders saw no reason to defend the monarchy. Although there was no desire among the majority of Brazilians to change the country's form of government, republicans began pressuring army officers to overthrow the monarchy. After a 58-year reign, on 15 November 1889 the Emperor was overthrown in a sudden coup d'état led by a clique of military leaders whose goal was the formation of a republic headed by a dictator, forming the First Brazilian Republic. Throughout the coup Pedro II showed no emotion, as if unconcerned about the outcome. He dismissed all suggestions put forward by politicians and military leaders for quelling the rebellion. The Emperor and his family were sent into exile in Portugal and France. Although there was significant monarchist reaction after the fall of the Empire, this was thoroughly suppressed, and neither Pedro II nor his daughter and heiress supported a forced restoration. Duarte Pio, Duke of Braganza, Head of the Portuguese Royal House and de jure King of Portugal since 1976. After the revolution of 1910, King D. Manuel II settled in England until his death in 1932. He was childless, and descendants of D. Miguel (the usurper of 1826) claimed the throne. In 1920–22, the two (of the now four) branches of the House of Braganza negotiated a pact under which D. Manuel named as his heir D. Duarte Nuno of Braganza, grandson of D. Miguel. D. Duarte Nuno, now Duke of Braganza, remained the Braganza pretender until his death in 1976. In 1942, he married a great-granddaughter of Emperor D. Pedro II of Brazil, uniting the two lines of the House. Dom Duarte Nuno was succeeded as pretender by his son, D. Duarte Pio of Braganza (born 1945). D. Duarte Pio served in the Portuguese Armed Forces and took the customary oath of allegiance to the Republic, but Portuguese monarchists still recognize him as the pretender to the Portuguese throne. In 1995 he married Dona Isabel de Herédia, a Portuguese businesswoman and descendent of the Viscount of Ribeira Brava. He worked actively in support of the independence of East Timor from Indonesia. Duarte Pio and Isabel have three children, each bearing the traditional stylings of the Braganzas. Duarte Pio's oldest son is Afonso de Santa Maria, who bears the traditional titles of Prince of Beira (as heir apparent to the heir apparent to the King of Portugal) and Duke of Barcelos (as heir apparent to the Duke of Braganza). He has a brother, Dinis, Duke of Porto, and a sister, Infanta Maria Francisca. Maria Pia de Saxe-Coburgo e Bragança, who claimed she was an illegitimate daughter of King D. Carlos I of Portugal, began asserting that she was the heir to the throne from 1957. Allegedly, she adopted the Italian Rosario Poidimani, transferring her claimed rights to the Portuguese throne to him. Prince Luiz of Orléans-Braganza, Head of the Brazilian Imperial House and de jure Emperor of Brazil since 1981. After the military coup of 1889, Emperor D. Pedro II settled in France until his death in 1891. His eldest daughter and family goes to live in the Chateau d'Eu in french Normandy. She was recognized by the very brazilian monarchists as Empress-in-Exile as D. Isabel I of Brazil, until her death in 1921. She was succeded by her grandson, Prince Pedro Henrique of Orléans-Braganza, as Head of the Imperial House of Brazil, and he by his son and current Head, Prince Luiz of Orléans-Braganza. With the fall of the banishment of the Imperial Family in 1920, some Princes returned to live in the fatherland, while another remains in Europe. After the end of the World War II, Prince Pedro Henrique, then Head of the Imperial House and married to Princess Maria Elisabeth of Bavaria, finally came to Brazil with his big family, althrought the Imperial House of Brazil was divided in two branches because of the rennounce of Pedro de Alcântara, Prince of Grão-Pará in 1908. Today, some members of the two branches of the Imperial Family live in the Grão-Pará Palace, some married to european royals and nobles live in Europe, and the most live like commom people in their houses or apartments. Very active, the Vassouras Branch of the Imperial Family, most recognized nationally and internationally, led a growing movement to the restoration across the brazilian biggest streets. D. João II of Braganza - The first Braganza King of Portugal. The first Emperor of Brazil. The traditional symbol and crest of the House of Braganza is a green wyvern, commonly taken to be a dragon, representing Saint George, patron saint of Portugal. This symbol can be found in many different monuments in Portugal and Brazil, such as the Monument to the Independence of Brazil in São Paulo and in the palaces of the Imperial family in Rio de Janeiro and Petrópolis. It is famously found atop the Portuguese Crown Sceptre, the Sceptre of the Dragon and the Sceptre of the Emperor of Brazil. The wyvern is also sometimes used as a supporter in the coat of arms of both the Brazilian and Portuguese branches of the family. Because of its use in heraldry by the Braganza as the ruling house, and given Pedro IV's link with Porto, a dragon was added to the old coat of arms of the municipality of Porto and is still a part of F.C. Porto's coat of arms, who are nicknamed "the dragons". ↑ There is some controversy regarding the ancestry of Inês Pires (born in Borba, c. 1350). She was the daughter of Pedro Esteves (for that she is sometimes called Inês Pires Esteves) and Maria Anes ("Grande Enciclopédia Portuguesa e Brasileira", Editorial Enciclopédia, Lisboa, vol. 4, pp. 172; António Caetano de Sousa, "História Genealógica da Casa Real Portuguesa", Atlântida Ed., Coimbra, 1946, vol. 2, pp. 25). Some historians and genealogist claim that her father was a converso - a Jew converted to Catholicism (Augusto Soares d' Azevedo Barbosa de Pinho Leal, "Portugal Antigo e Moderno", Cota d' Armas, Lisboa, 1990; Isabel Violante Pereira, "De Mendo da Guarda a D. Manuel I", Livros Horizonte, Lisboa, 2001), while the majority of sources give her a long and well attested noble Christian ancestry (Felgueiras Gayo, "Nobiliário das Famílias de Portugal", Carvalhos de Basto, Braga, 1989). ↑ Portuguese Constitution of 1826 p. Title 1, Article 5. ↑ McMurdo 1889, p. 363.